It all comes down to this! In an unexpected matchup, we have Sky Strikers against Burning Abyss! 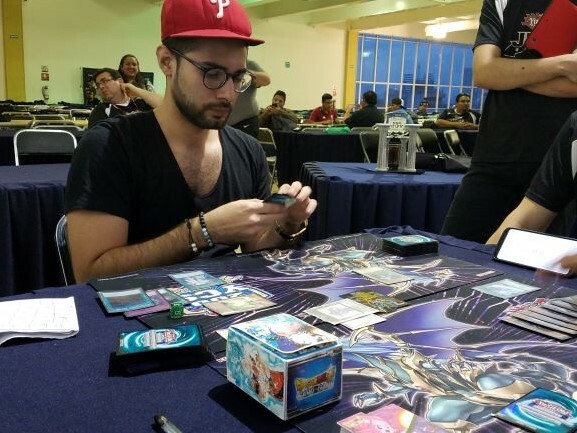 Jose Lagunes, from Vera Cruz, is playing Sky Strikers. Much of the Top 64 was Sky Strikers, proving that the strategy is one to be reckoned with. He’s up against Andres Torres’s Sekka’s Light Burning Abyss Deck now! We just saw Torres take a commanding victory in his Top 4 Feature Match, but can he do it again? Sky Strikers won the other 200th YCS events in Utrecht and in Columbus. Will Lagunes join his Sky Striker brethren in victory, or will Torres get the upset? It’s time to Duel! The Duelists shook hands, then rolled the die. Five to three, Torres will play first. He began with Destiny HERO – Malicious; Ash Blossom & Joyous Spring; Black Luster Soldier – Envoy of the Beginning; Farfa, Malebranche of the Burning Abyss; and Scarm, Malebranche of the Burning Abyss. He Normal Summoned Scarm and Special Summoned Farfa, allowing him to Special Summon Dante, Traveler of the Burning Abyss. It detached Scarm to send Effect Veiler, Sekka’s Light, and Black Luster to the Graveyard. He banished Sekka’s Light to return Malicious to the Deck and draw Cir, Malebranche of the Burning Abyss. He used Cir and Dante to play Beatrice, Lady of the Eternal in Defense Position, and searched for Tour Guide From the Underworld in the End Phase with Scarm. Lagunes played Terraforming to get Sky Striker Airspace – Area Zero. He activated it, then Set Evenly Matched, using Area Zero to trade it for Sky Striker Mecha Modules – Multirole. He activated Multirole, using its effect on Area Zero. He activated Area Zero in the Graveyard, Torres used Ash Blossom, and Lagunes had PSY-Framegear Gamma! He Special Summoned Gamma and PSY-Frame Driver, then resolved Area Zero to put Sky Striker Ace – Raye in play. Torres detached Farfa from Beatrice, sending Malicious to the Graveyard. Farfa’s effect banished Driver. Lagunes used Raye to play Sky Striker Ace – Hayate. It attacked directly and sent Sky Striker Mobilize – Engage! to the Graveyard. Then, he used Hayate to play Sky Striker Ace – Kagari and add Engage to his hand. He sent Gamma and Kagari to the Graveyard to play Knightmare Phoenix, then activated Engage. He searched for Sky Striker Mecha – Widow Anchor. Widow Anchor stole Beatrice, then he used it and Phoenix to play Knightmare Unicorn. The Dante Xyz Material added Cir to Torres’s hand. Lagunes used Multirole to Set Engage and Widow Anchor, and Driver returned to the field. Torres drew Scarm. He Normal Summoned Tour Guide, bringing Fiendish Rhino Warrior to the field. He banished Malicious from his Graveyard to Special Summon another Malicious. Malicious and Rhino Warrior were used to play Underclock Taker, and the Rhino sent Farfa to the Graveyard. Farfa’s effect banished Knightmare Unicorn. 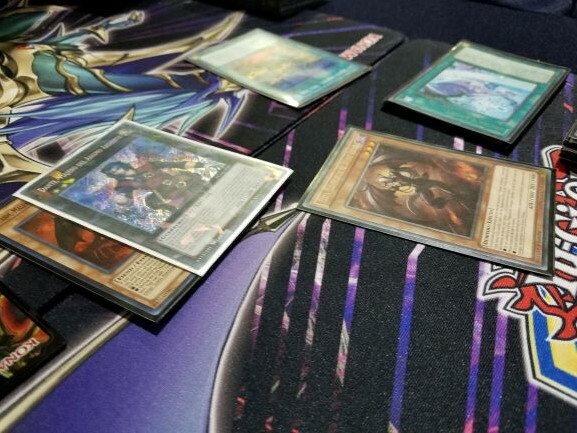 Torres banished Black Luster and Farfa from the Graveyard to play the Black Luster in his hand, then used Underclock Taker’s effect – and Lagunes had Ghost Ogre & Snow Rabbit to destroy Underclock before it could resolve (since Underclock needs to point to a monster to reference for its effect, it must remain on the field to properly resolve). Torres Special Summoned his third Malicious, using it with Tour Guide for Knightmare Phoenix. It discarded Cir to destroy Multirole, and Cir revived Dante. He used Dante and Phoenix to play Topologic Trisbaena, and Dante returned Cir to his hand. He Special Summoned Scarm from his hand, which self-destructed. However, that was enough to trigger Trisbaena! Trisbaena’s effect wiped out Lagunes’s back row and dealt 1000 damage, then Black Luster Soldier attacked! It wiped out Driver, then Trisbaena attacked directly. Lagunes was down to just 1000 Life Points, while Torres had 6500. Lagunes returned Knightmare Unicorn to the field in the End Phase. Lagunes had Unicorn and two cards in his hand. He played Area Zero and used it to send Unicorn to the Graveyard, adding Engage to his hand. He played it to get Multirole and draw a card. He activated Multirole and Sky Striker Maneuver – Afterburners!, destroying Trisbaena. He used Multirole to send Area Zero to the Graveyard, and Special Summoned Sky Striker Ace – Raye. Raye brought in Sky Striker Ace – Kagari, which returned Engage to his hand. He played it, this time searching for Widow Anchor before drawing a card. Widow Anchor took control of Black Luster. Kagari and Black Luster attacked directly, leaving Torres with 1300 Life Points. Lagunes used Kagari to play Sky Striker Ace – Shizuku. In the End Phase, Multirole Set Widow Anchor and Engage, then Shizuku searched for Engage. Black Luster returned to Torres’s control. Torres drew Effect Veiler. He went to the Battle Phase, and his attack was stopped by Widow Anchor. Lagunes also flipped Eagle Booster to add to his Multirole count. Torres Set Cir. Multirole put Afterburners on the field. Lagunes used Shizuku to play Hayate, and Torres negated it with Effect Veiler to stay in the Duel. Lagunes played Engage to get Sky Striker Mecha – Shark Cannon and draw a card. Then, he flipped up another Engage to get Sky Striker Mecha – Hornet Drones and draw again. He activated Hornet Drones and Chained Shark Cannon to Special Summon Topologic Trisbaena and a token. He used Hayate to play Kagari, but forgot about Trisbaena’s effect! Kagari’s effect returned Area Zero to his hand, and Trisbaena banished Kagari along with Lagunes’s own three back row cards. Will he be able to recover from such a crushing blow? Lagunes played Area Zero, then used his Sky Striker Ace Token to play Shizuku. He used Shizuku and Trisbaena to play Topologic Bomber Dragon and Set a back row card. He tried using Area Zero on the Set card, but failed to get anything. He Set the last two cards in his hand in his back row. Torres drew Scarm, and Lagunes used Widow Anchor to take Black Luster. Torres Flip Summoned Cir and Normal Summoned Scarm, using his Fiends to play Dante, Traveler of the Burning Abyss in his Extra Monster Zone. It detached Cir to send Effect Veiler, Ghost Ogre & Snow Rabbit, and Fiendish Rhino Warrior to the Graveyard. Cir Special Summoned another Dante from the Graveyard, and the Rhino sent Farfa to the Graveyard. Torres specifically played his new Dante in a zone to trigger Lagunes’s Bomber Dragon, destroying everything but Bomber Dragon and the first Dante. Farfa’s effect banished Bomber Dragon, and Dante attacked directly to end this grueling Duel! This first Duel was so back-and-forth, it took 45 minutes alone! There was 15 minutes on the clock, and the Duelists wanted to make sure not to potentially fall in the end of Match procedures. They quickly went to their Side Decks to try and gain an edge in the second Duel. Lagunes played Raye and Link Summoned Shizuku. He Set a back row card, and Shizuku’s effect put Engage in his hand. Torres had Farfa, Foolish Burial, Scarm, Fiendish Rhino Warrior, and Libic, Malebranche of the Burning Abyss. He drew Graff, Malebranche of the Burning Abyss. He led with Rhino Warrior, and Special Summoned Libic. The Rhino’s effect kept Libic from destroying itself, and Torres Xyz Summoned Dante. It detached Rhino to send Scarm and two Ash Blossom & Joyous Spring to the Graveyard, and the Rhino sent Fabled Soulkius to the Graveyard. Lagunes read Soulkius, and decided to flip Shark Cannon to banish it. Torres used Dante and the Graff from his hand to play Beatrice, Lady of the Eternal. Graff Special Summoned Scarm, which destroyed itself. Beatrice destroyed Shizuku in battle, and Lagunes brought Raye back to the field. In the End Phase, Scarm added Tour Guide From the Underworld to Torres’s hand. Lagunes used Raye to Special Summon Shizuku, adding another Engage to his hand. Lagunes played Multirole and Engage, searching for Area Zero. He activated it, then Link Summoned Kagari to return Engage to his hand. Area Zero sent Kagari to the Graveyard, adding Sky Striker Maneuver – Afterburners! to Lagunes’s hand. He used Multirole on Area Zero, and Torres Chained Beatrice’s effect, detaching Dante to send Cir to the Graveyard. Dante returned Graff to the hand, and Cir returned Dante to the field. Area Zero Special Summoned Raye to Lagunes’s side of the field. Lagunes used Raye to play Hayate. Afterburners destroyed Dante, which returned Cir to the hand. Engage searched for Widow Anchor, and Lagunes drew a card. Another Engage searched for Sky Striker Mecha – Eagle Booster, and he drew another card. Widow Anchor took control of Beatrice. Hayate and Beatrice attacked to drop Torres to 4000, with Lagunes at 7100. In Main Phase 2, he used Beatrice and Hayate to play Knightmare Phoenix. The Libic Xyz Material Special Summoned Cir from Torres’s hand, with its effect negated. Lagunes Set two back row cards and moved to the End Phase. Multirole Set Widow Anchor and Shark Cannon. Torres drew Magic Deflector with only forty-five seconds in the round. He played Tour Guide, and Lagunes used Ash Blossom & Joyous Spring! Torres used Tour Guide and Cir to play his own Knightmare Phoenix, discarding Graff to target Lagunes’s Set Widow Anchor, destroying it and letting him draw Gameciel, the Sea Turtle Kaiju! Cir Special Summoned Dante, and Foolish Burial sent Malicious to the Graveyard. He used it to Special Summon another Malicious, using it with Dante to play Isolde. The round timer ended, and Torres needed to deal more than 3100 damage in Main Phase 1 to win this Duel. Dante added Scarm to his hand, and Isolde searched for Black Luster Soldier – Envoy of the Beginning. Torres Special Summoned his third Malicious, using it with Isolde to Link Summon Topologic Trisbaena. He Special Summoned Scarm, which destroyed itself and triggered Trisbaena. It banished all of Lagunes’s cards, dealing 2000 damage, but it wasn’t enough! Lagunes wins the Duel, and we’re going to one more game! This final Duel would be two turns for each Duelist. After that, the Duelist with the higher Life Points wins. If it’s still tied, the Life Points will be checked at the end of each turn. The Duelists rolled to see who would go first – a 1 for Lagunes, 6 for Torres. Torres chose to play second. Lagunes started with Sky Striker Mecha – Hornet Drones into Kagari, getting Hornet Drones back. Then he played Shizuku and Set three cards in his back row. Shizuku searched for Engage. Torres had Fiendish Rhino Warrior, Fabled Soulkius, Gameciel, Twin Twisters, and two Farfa. He Tributed Shizuku and handed over Gameciel, then Normal Summoned Rhino Warrior. He activated Farfa in the hand, Lagunes flipped Mind Crush on Farfa, and Torres used Twin Twisters to discard one Farfa, destroying Hornet Drones and Widow Anchor. Torres lost his other Farfa to Mind Crush as well. With both his Burning Abyss monsters gone, Torres had to pass. Lagunes was taking what might be his final turn and thought a long while about his options. He had Gameciel attack Fiendish Rhino Warrior. Torres started to use the Rhino’s effect, but at that moment the table judge informed Lagunes he was receiving a slow play penalty. Since he had received the same penalty earlier in the tournament, that penalty was being upgraded to a game loss. It can be tough to watch such a high stakes game end with a penalty like this. It’s supremely important to remember that the rules of the game extend beyond what cards you have. These rules govern aspects of the Dueling such as slow play, and are necessary to ensure the integrity of the tournament and to make certain everyone can have fair Duels. Breaking one of these rules is just as serious as breaking a rule with your cards. Even though it was the finals, it would be unfair to not give the appropriate penalty for an infraction. It’s uncertain how that final Duel could have played out. While Lagunes did lose to his slow play penalties, both players Dueled admirably. Making it to the finals of one of the biggest YCS tournaments in history is something to be proud of. 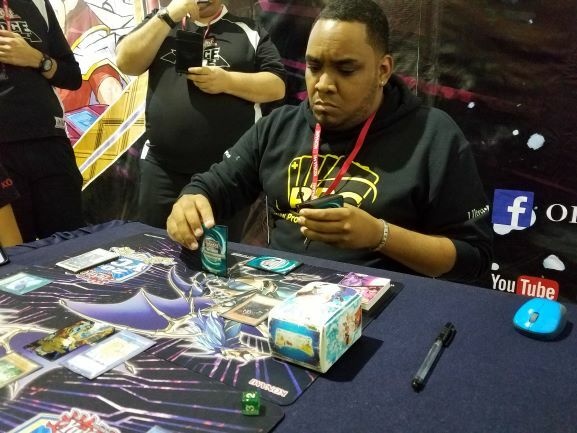 Thus, we crown our newest YCS Champion – congratulations to Andres Torres, going 18 total rounds with Burning Abyss!